As I’m sure you’re sick of hearing me say, one of the most intriguing things about VR is its palpable sense of scale. Since VR physically places you inside the game world, it provides a believable feeling of how large or small objects are relative to your own body. Stand at the foot of a building, and you’ll have to crane your neck to see up the face of it. Perch at the edge of a cliff, and you may well get wobbly legs peering into the drop below. All VR games have this phenomenon in some form, it’s just a natural part of how the tech works. But no game I’ve played uses that sense of scale quite like A Fisherman’s Tale. 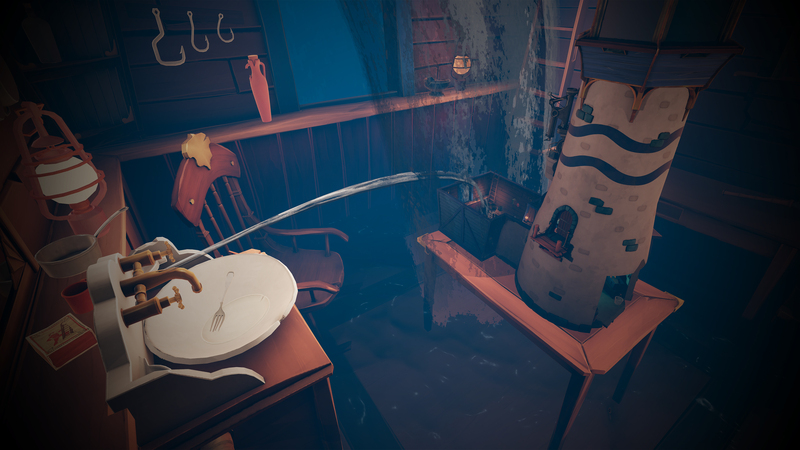 This charming, quirky little game also happens to be one of the most intriguing VR titles I’ve played in some time. It also has one of the strangest premises I’ve seen in any game. You assume the role of a fisherman who lives inside a lighthouse, which is already a little bit odd because fishermen don’t operate lighthouses. In fact, they need someone else to do that for them in order to be fishermen. Otherwise they’re simply lighthouse-keepers. Frankly, though, this fundamental contradiction in logic is, in the grand scheme of things, small fry. You see, you’re not just a regular fisherman, you’re a puppet fisherman. And I don’t mean that you’re a pawn in the schemes and machinations of Big Fish. You’re a literal wooden figurine. If that wasn’t weird enough, you’re a wooden figurine whose hobby is making a model of his own lighthouse. That’s right: You’re a puppet that makes puppets. As concepts go it’s about as out there as a fishing line cast by the Incredible Hulk. But the point of this truly odd premise is not so much to provide a coherent narrative (we’ll get onto that later). Rather, it’s to act as a framing device for the game’s central mechanic. And what a mechanic it is. Basically, at some point in the story you take the roof of your lighthouse scale model, and find your puppet self looking down on, well, you. Inside the model there’s a tiny version of yourself moving around exactly as you do. What’s more, if you look up, you’ll notice that the roof of your actual lighthouse has vanished, while a giant version of yourself now looms over you. The effect is essentially like standing between two mirrors, only each concentric reflection gets larger as you go up. Oh, and you can put your hand through the mirror. Poke your regular puppet finger into the model (now there’s a disturbing phrase) and a giant puppet-finger will appear inside your house. What results from this is a spatially minded environmental puzzle game. It’s a genius idea, and A Fisherman’s Tale makes pretty good use of it. All the puzzles revolve around using the model to make objects bigger or smaller. An early example involves retrieving an object from inside a seashell. It’s too small to retrieve from the standard-sized seashell, but if you place that shell inside the tiny model, then your giant self places a much larger version of the shell inside your lighthouse, letting you retrieve a larger version of the object you need that way. 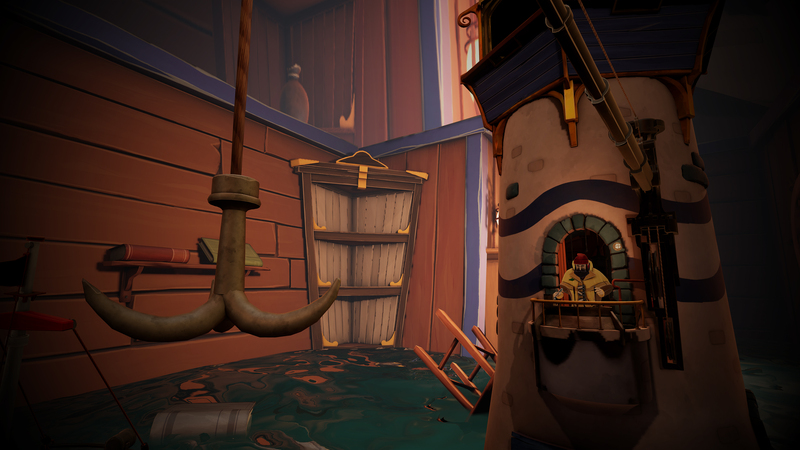 I can’t really go much deeper into this without spoiling all the puzzles, but safe to say that A Fisherman’s Tale twists and plays with this concept throughout. And while it’s by far the game’s most significant novel idea, it isn’t the only one. Another smaller thing that nonetheless pleased me relates to more familiar VR interactions. 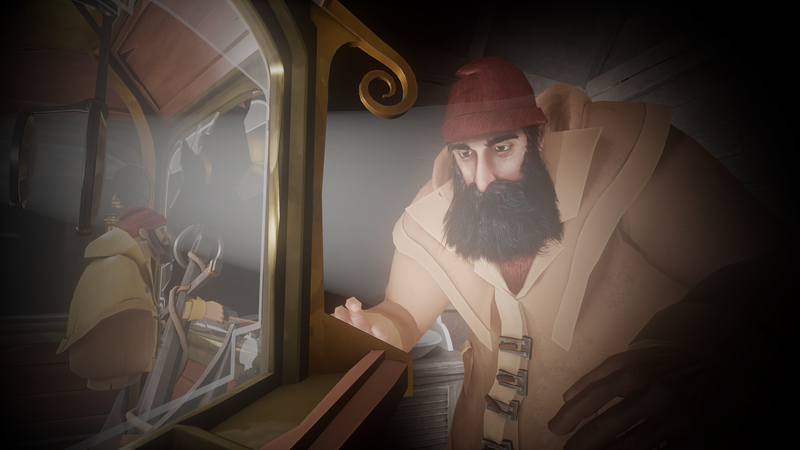 Like most VR games, A Fisherman’s Tale lets you grab, swing, and throw objects using your hands. Unlike most VR games, here you can press the A and X buttons on your touch controllers to significantly extend your reach like a wooden Inspector Gadget. This make the game so much easier to play, as you don’t have to constantly lean over and risk crashing into walls to pick up objects, or stoop and put your back out (this is a risk for me now) to retrieve an object you’ve dropped. It’s not a game mechanic as such, just a little quality-of-life feature that I hugely appreciated. For all that A Fisherman’s Tale does right, however. There are a couple of issues. Firstly, the story it tells is a little wishy-washy. The writing is decent enough, sporting a quirky sense of humour that suits the overall tone, and a couple of delightful side-characters you meet as you explore. That said, the broader tale, which is to do with the fisherman’s relationship with his father, simply doesn’t go anywhere meaningful, while the actual ending is a complete non-event. The main issue, however, is that A Fisherman’s Tale only scratches the surface of the potential of its central concept. Unless you get stuck on a puzzle, the game probably won’t take more than two hours to complete, with maybe a dozen puzzles overall. Moreover, the final chapter comprises a single puzzle that, frankly, is more fiddly than fun. I’m all for short games provided they’re appropriately priced, but £13.99 for little over two hours of entertainment is on the fence. That said, I did pay for this out of my own pocket, and I don’t regret that decision. 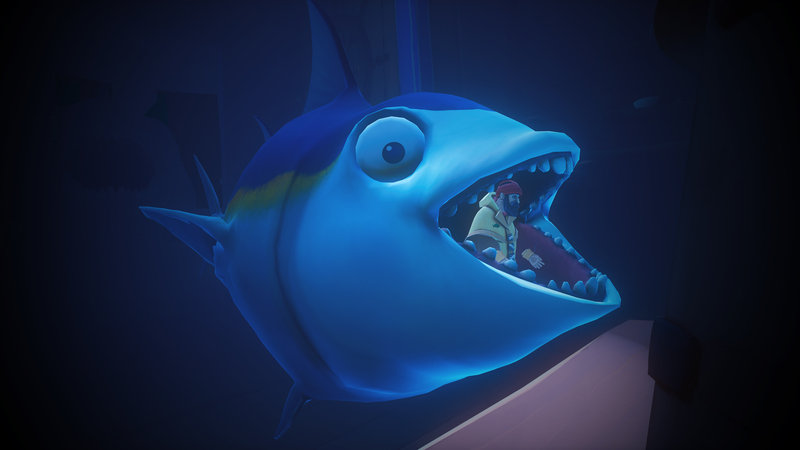 Although it is a fleeting experience, A Fisherman’s Tale does something that I genuinely haven’t seen before in gaming. Also, while the ending is admittedly a bit flat, the rest of the game I thoroughly enjoyed. So if you’re into your VR, you should absolutely check this out.